The first terrorist to be executed in the United States. An Al Quaida cell smuggled in to free “their brother.” The Homeland Security Czar. A resourceful high school teacher and her classroom volunteer. In the small rust-belt town of Hammerville, Ohio, all these characters collide in an unsettling, yet frighteningly believable story of danger, human tragedy and redemption. Dee Dee Sterber just wants to teach, to make a difference in the lives of her students. And maybe to meet the right guy. With missionary zeal, she returns to teach in her hometown determined to open her students’ minds to the ideas of the world’s greatest writers. Instead she finds out she has to act to save them from one of the world’s greatest threats. While two men–Jerod, the handsome but obnoxious volunteer mentor, and Jesus, the charming and mysterious Latin American man just hired as a substitute teacher–vie for her attention, her cherished small town is invaded by the condemned terrorist, Asad Akadi, a company of National Guard troops, the FBI and a frenzied media. Then she discovers to her horror that Rashid, the new foreign exchange student in her room, is in fact a young terrorist recruit from Afghanistan. Rashid is soon joined by Yassim, the cell leader, and the other Islamic terrorists, who have been especially recruited for this mission. With surprising ease, this terrorist cell slips into the United States and make their way to rural Ohio. All the while the Director of Homeland Security, Harold Samson, becomes increasingly frustrated that the government’s efforts to pursue and apprehend the terrorists have become bogged down in bureaucracy and thwarted by the election-year politics. On a quiet day in late October, just hours before the scheduled execution of Akadi in the nearby maximum security prison, the small terrorist cell carries out a carefully coordinated and daring attempt to free him. Once inside the school, they disable the phone lines and shoot out the lights and then, to demonstrate their ultimate commitment, they execute two teachers including Dee Dee’s best friend, Christie Ferguson. Controlling the only remaining channel of communication, the cell members make their demands directly to President Ryan Gregory, offering to trade the 300 students and teachers for their condemned “brother.” Only a few days before his own re-election bid, the first-term president is left with few good options. In desperation, he authorizes a military attack on the school that falls tragically short. Using a combination of luck and ingenuity, Dee Dee and Jerod left for dead by the terrorists, recover and confront the terrorists, one by one, in the darkened corridors of the high school. As they are planning in the basement locker rooms, the heroes are surprised by the first two members of the cell sent to search them out and, using only a baseball bat and their hands, they outsmart and overpower the intruders. But their greatest test comes when the teacher and her friend must challenge the two remaining terrorists, both armed with AK-47’s in the school cafeteria filled with hundreds of cowering students and teachers. With no communication channel to the outside world and no weapons, these two resourceful individuals must outthink the intruders, frustrate the terrorist plot and rescue the students. Their struggles bond them tightly, setting the stage for a love affair neither one of them could have predicted. When this unlikely pair completes their mission, they are bloodied and broken, but ultimately victorious and deeply committed to each other. 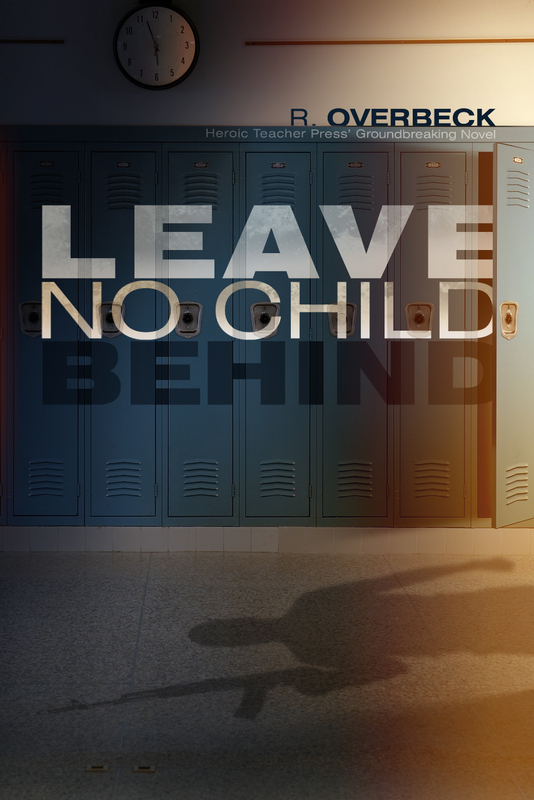 The path of the story of Leave No Child Behind is laid through the carefully interwoven tales of multiple narrators—Harold Samson, the terrorists, and of course, Dee Dee, the small town English teacher caught in the center of the maelstrom. In a day when the term “school shooting” has entered the lexicon, heroic teachers have protected students and saved lives, sometimes at the expense of their own. Dee Dee and Jerod exemplify this new breed of teacher. 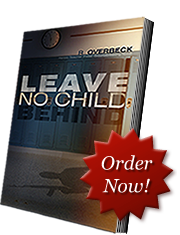 No Child Left Behind tells the tale of two common individuals and their battle and victory against uncommon odds.